July 6, 2001: When a friend writes an exceptional book it's your victory too --everyone's victory, really, and against all odds, because it doesn't matter who writes the needed books as long as they get written. But when it's the work of a friend ... when now and then over the course of a year or two you've received in the mail, unbidden, a few pages of new work, pages familiar in their hard-won crafted style but different too, pulsing differently ... when you've been joined to the writing in this way, and you're pulling for your friend, hoping the culminated work fulfills the promise of its fragments ... and then one day you receive, unexpectedly, the published book, and it's beyond what you hoped ... then the victory inherent in any great book is sweeter, because you know that though your efforts may have faltered and failed, one of your kind, one of your circle, has gone beyond himself and made it through, creating something that contains and radiates what you hold dear in this world. 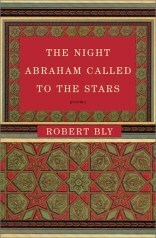 That is how I felt when I read Robert Bly's new book of poems, The Night Abraham Called to the Stars. Robert has written many good books in a long life, but none that haunts like this one. Briefly as to technique: Every poem has six unrhymed long-lined verses of three lines each, each line beating to the same subtle measure, so there is a sense of focused intensity, an act of will engaged in an act of passion. The poems follow the classic Islamic form of the "ghazal," in which each stanza is like a separate poem, a poem-within-a-poem. Yet, within that containment of orderly form, or upon it, there is a wildness of range and detail and history that is, for me, a little dizzying. It's as though an ancient Mediterranean potter was casting vases or tureens of exactly the same dimensions, but upon each piece the potter has painted a very different, vivid, joyful, disturbing sequence of pictures. Adding oddly to this effect is that in this slim book of 95 pages, half of the pages are blank! Open the book anywhere, and there is a poem printed on the right-hand page, but the left-hand page is pristine, unmarked, white. (As a professional, I marvel that Robert got a publisher to go along with the scheme.) So you read a deceptively simple line like Some marriages are rafts. It stops you, makes you consider the marriages you know, and while you see them reflected in the glean of those words there is the silent space of the empty facing page reflecting something ever larger than the words. Teaching poetry to 10th-graders, I've said that a poem begins in one silence and ends in another; and that the poem is a record of how the silence changes. The device of the blank pages offers a visible, tangible emblem of those silences. You turn the page the poem is printed on, and there is another emblematic silence. Each poem is faced and backed by silence. To return to my image of the potter, each blank page in this book is like the space within the vase, within the tureen. Not blank, then, but hollow -- waiting to be filled by flowers or stew. The poet does not know how you'll fill it, but it's there for you to fill, with your own precious silence if with nothing else. One poem ends: The candle is not lit / To give light, but to testify to the night. And so these unmarked pages testify to silence. For silence is not the absence of sound; it's the presence of something larger than sound in which all life is contained. In an America increasingly confused by a constant barrage of conflicting and intrusive bits of noise, it is powerful for a book to take its stand with the values of silence. Whole worlds, within us and around us, live and die in these verses. As in: The bird can sing for hours through its beak! / It picks its grain carefully. But we, the sons / Of forgetfulness, eat the flesh that died shouting. And as in: There is only one mortgage and so many forms of payment! / There is one peace and so many forms of war. / The furry shadows are bringing gifts to the door. And as in: The donkey we have loved for years may be killed / And cooked one day while we go on singing. / So don't write a single poem without gratitude. And as in: Men and women spend only a moment in Paradise. / The two lovers watch Charlie Chaplin eat his shoe. / And a moment later find themselves barefooted in the grave. In a strange way the book is one long poem referent to all of human history, or at least to what Robert Bly values of it. As you read, so many names are evoked from so many eras: Moses, Alexander, Giordano Bruno, Keats, Abraham, Noah, Newton, Chaplin, Monet, Horace, Dickens, Eudalia, Plato, Robespierre, Rousseau, Hannibal, Whitman, Savanarola, Calderon, Lucretia, Emerson, Mandela. Madame Bovary could not endure the good life. / She was like us: She wanted disgraceful nights, / Torn clothes, and the inconstant heart. Mahler, Robert Lowell, Henry James, Abelard, Rembrandt, General Patton, Nebuchadnezzar, Sophocles, Jesus, Napoleon, Rilke, Boehme, Ibn Arabis, Adam, The Baal Shem, Francis Bacon, Chekhov, William Blake, Joseph, Mary, St. Jerome. Every poem is a cover over something naked. / Emily Dickinson's poems are shawls woven / From the lengthened hair of the ignorant and insane. Peter, Seth, Shem, St. Francis, Rimbaud, Augustine. The ocean is not wild enough to have created Melville's soul. Gogol, Kierkegaard, Cézanne. And though I could have wished for Elvis to included, and Billie Holiday, Bette Davis, Marilyn Monroe, Duke Ellington, John Coltrane, Hildegard Von Bingen, Crazy Horse, Benito Juarez, Lady Godiva, Marie Laveau (this is an old argument Robert and I have) -- still Bly's poems mark the history that lives in him, and the main thing is that it lives. Even when you don't know who the devil some of these people are (I'm a little rusty on my Ibn Arabis, and on my Boehme), their names arise in the poems like reflections upon water, they ripple and are gone, leaving a sense that many have passed before us and yet remain more with us than we think. We may be alone, but we're not only alone; even our loneliness is accompanied. Those who rely on linear thinking either should avoid this book or cling to it, depending on whether or not they want to change. For no poem as a whole makes linear sense. What Robert Bly wrote many years ago about the Swedish poet Tomas Tranströmer, could apply as well to his own new poems: "One of the most beautiful qualities in [these] poems is the space we feel in them. I think one reason for that is the four or five main images which appear in each of his poems come from widely separated sources in the psyche. His poems are a sort of railway station where trains have come enormous distances to stand briefly in the same building ... The poems are mysterious because of the distances the images have come to get there." To this I would add something a 10th-grade girl named Evann Wilkerson wrote for one of my classes: "Good poetry remains restless on the page." For all their elegance of rhythm and syntax, for all the careful containment of their form, these are restless poems, poems that lie awake all night. It's as though Robert, who is in his seventies, gets still wilder as he gets older, not the wildness of a storm but the wildness of a tree alive with birds and small animals that is blown by a storm. It's a tree that offers shelter but that may also be struck by lightning. The hermit said: "Because the world is mad, / The only way through the world is to learn / The arts and double the madness. Are you listening?" That's practical advice, as I see it. So is this: We always want to intervene when we hear / That the badger is marrying the wrong person. / But the best thing to say at a wedding is "Amen." And this: Let's keep disaster remembered in our poems. / Our memory feeds on ruin just as cows / Stand around drinking from river water. And, in a way, even this: I know how much ruin love can bring. / But at night I hang around the orchard / Hoping to catch one breath from the lovers' tree. These are poems that keep many secrets, yet reveal them in the same breath. For all his evocation of history and culture, for all his joy in beauty, and for all his daring, there is an ever-present and inescapable danger prowling Robert Bly's book. You and I will never have one whole day of light. / At three o'clock, a wall will creak, or a hare will die. And: It's strange that our love of Beauty should lead us to hell. / I caught one glimpse of you, and a moment later / My house and books were all thrown into the fire. The word "ruin" occurs many times in this slim volume. These aren't poems that harbor the illusion that anyone can avert ruin. These poems sing ruin in, celebrate it, then sing it on its way. I don't know who Caedmon is and I don't have to, for these lines to reach into me: The grapes of our ruin were planted centuries / Before Caedmon ever praised the Milky Way. / "Praise God," "Damn God" are all synonyms for "Amen."